Why It Makes The List: Not only is it an Alfa Romeo, but it's got racing pedigree too. Winning the European Touring Car Championship (1982-1985) and the British Touring Car Championship (1983), it's no wonder this car makes a great autocross platform. With enough room behind the front seats for two little ones and a 2.5L V6 capable of 160 horsepower and 157lb-ft or torque, you can't go wrong with this quirky Italian. 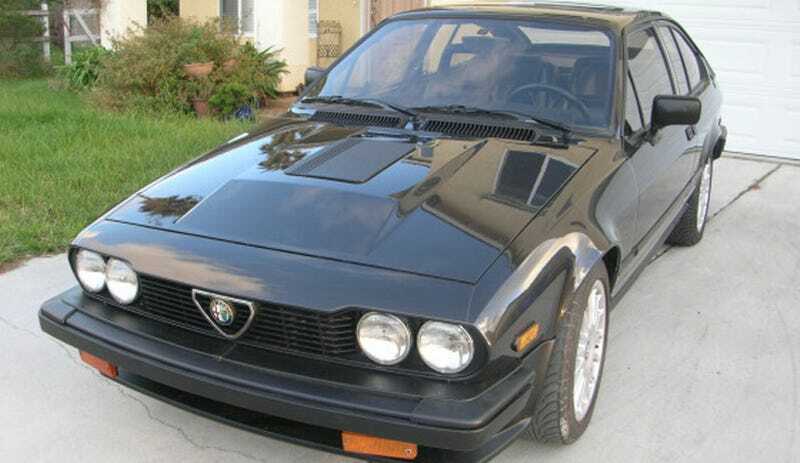 This 84 GTV-6 was stripped and repainted in 2006. Odometer shows 41723 miles, which is probably 141723. No rust on the car, even at the corners of the rear windows. Dash has some cracks as you might expect. A/C works great, windows have been tinted. Runs great. Needs double-clutching into 2nd gear as the syncros have gone, but this doesn't prevent daily driving. Rear defroster does not work, needs one lead to be re-attached to window. Rear seats are original black leather with no cracks, in good condition, front seats were redone by prior owner in black vinyl, and are in good condition. Sony in-dash AM/FM CD player. Recent Timing belt, brakes. Color is charcoal with silver on lower side panels. (This was the color scheme that was on the car when I bought it in 2003.) If you want a specific photo email me. Car is in San Diego, Southern California, but drives well and no reason it won't get you back home if you chose to drive it! Photos show the process of removing the old paint, priming and repainting, as well as the finished product. Original car manual is included.